This seems more sad than creepy. You hear that alienated and lonely folk? If you don’t know how to make friends then you deserve loneliness and public humiliation. If you go about it asking random strangers in a sort of pathetic way, then yeah, I’d say that’s about right. I feel more sorry for these guys than anything else really. So desperate are they for companionship that they have to seek out complete strangers – as if there was even a slim chance that anything could realistically come from a one-off meeting that happened purely by chance. Unless of course, my sympathy is misinformed and these guys are just faking it in a bid to get some. THEN it’s creepy. 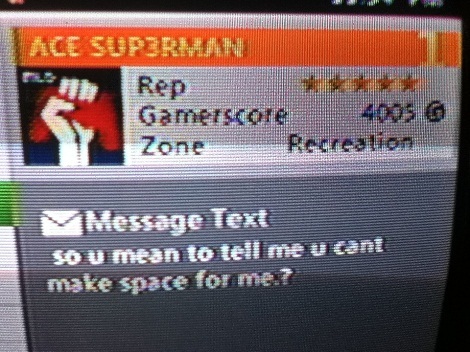 Are some people really this socially inept? 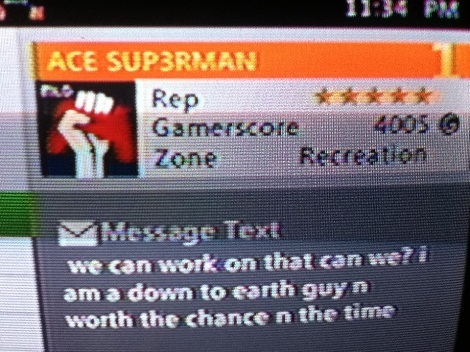 Do they really believe that hitting on random people via XBL is gonna help them in any way? People this socially inept probably don’t have much of a pool of women to talk to. 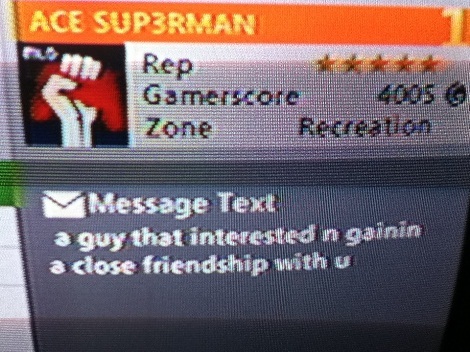 I suppose they think blindly approaching girls on XBL has a better chance of working than trying to approach the no girls who don’t exist in his day to day life. 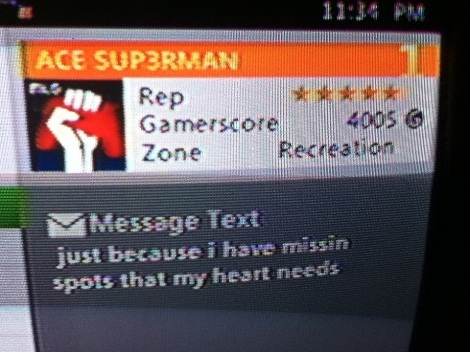 Move over OkCupid, XBox Live is the new dating website. Yeah, this is my submission and I have no idea how they found me because I haven’t played an online game in over a week. Just netflix. Ah bless him, he seems amazingly creepy; how could anyone resist him? I feel sorry for him, because he seems desperate and what he’s doing is more pathetic and annoying than anything. Or he’s just a prick who doesn’t know when to let up. Either way, loneliness is a sad, sad state. Why is this offending? Cry more. Seriously.